I would never have said this 7-8 years ago. Only our best for God and each other. We weren’t going to put something out into the world unless it was ready. As I journey closer to becoming my whole self with God, myself and others, I find my spirit around perfectionism changing drastically. Imperfections are not to be avoided. Long hours don’t necessarily equal quality work. Great is the enemy of good. Just get it out there and see what happens. What happens next? I leave all sorts of room for the Holy Spirit to do its thing. And the things I hear from people on Sunday affirm that choice. People get things from what I shared that I never planned or intended to happen. We all hear it differently. It’s the beauty of sharing the Word of God. I’m not in control of what the Word does once it’s leaves my structure. The old me would have wanted to control the whole process. Not anymore. It’s better this way. Now it’s a healthy striving. I still work hard. Really hard sometimes. We’ve got good news to share with a hurting world and I’ve given my life to this work. But the spirit behind it is different. It feels light, free and more joyful because I’m not trying to prove myself. I’m freely offering my little bit into the world and we’ll see what happens. Releasing the outcome is a beautiful thing. 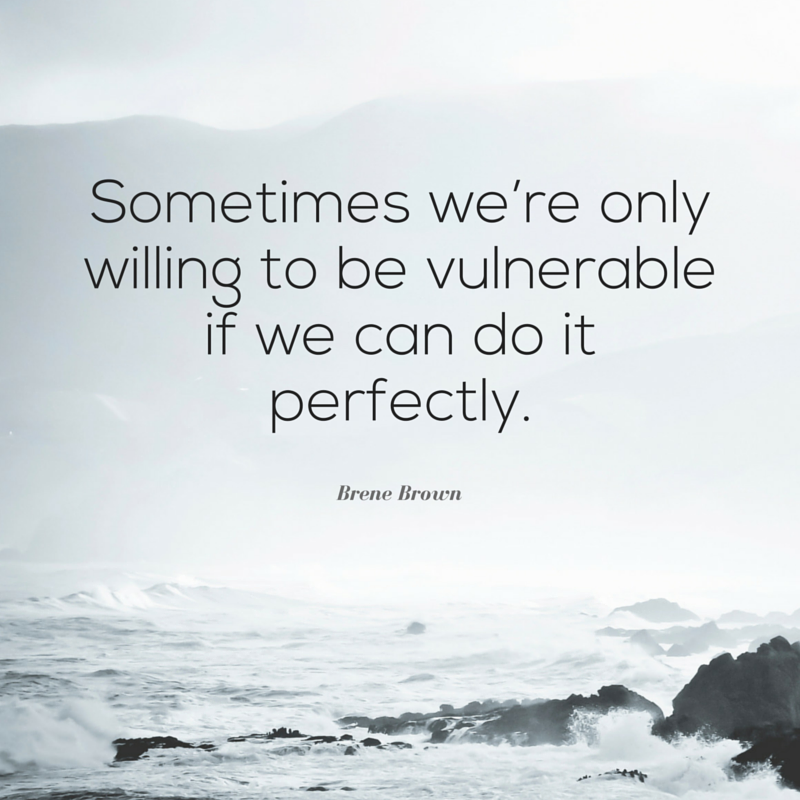 She goes onto say: Sometimes we’re only willing to be vulnerable if we can do it perfectly. So if you’ve figured out you have something to offer our world (and you do), offer it, please. Really. We need what you have inside. Don’t wait until something feels perfect. The world is changing fast. We don’t have time anymore to keep something in the Research and Development lab until it’s just right. Let it loose now. See what God can do with the little bit we have to offer. Want to read more on this stuff? Pick up Elizabeth Gilbert’s “Big Magic” or Rob Bell’s “How to Be Here.” And Brene’s work in “Daring Greatly” and “Rising Strong” is changing the way I arrange my heart and posture towards others. Great stuff.